Until l I watched a new TVB cooking program hosted by Ms Maria Cordero (again), I wasn’t sure how to cook this fruit, even though I saw it in the market umpteen times. Oh, it’s so simple to cook, actually! To my (pleasant) surprise, it was soft and mild (to almost tasteless in a good way) to eat. Most of all, this low-sugar, low-caloric fruit makes a good and healthy soup. Oh yes, it’s very mild in taste and because of that, I pan-fried the chicken leg before placing them into the soup… I have made myself a simple and delicious soup recipe for this! Not just a soup, it’s a 1-dish meal where I could eat the protein (chicken), the green (Chayote) and drink the nourishing soup! Trust me, you (especially the weight watcher) will like it, too. So, don’t forget to pick up some Chayotes the next time round when you do your marketing. 1) Heat wok with oil over medium-high fire, pan-fry chicken drumsticks till both sides lightly browned. 2) While waiting for the chicken to be done browning, bring a large pot of water to a boil. Add Chayote. Bring it to a boil again, before adding the lightly pan-fried chicken drumsticks. 3) Reduce heat to low fire and simmer for 30 minutes. Stir in salt and pepper 5 minutes before heat off. Serve hot. 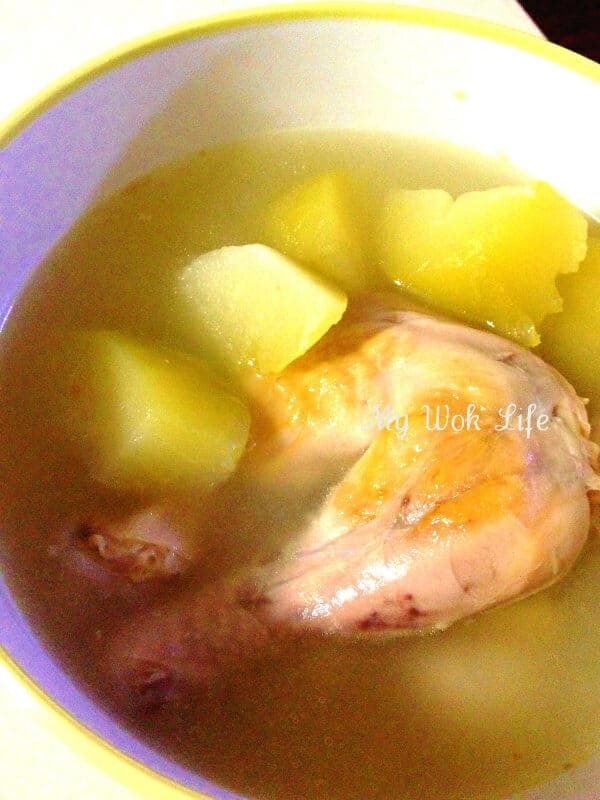 Dah dah….. A delicious, simple and healthy 1-dish soup meal is cooked. Isn’t it very easy to assemble?! A serving of my soup meal counts about 280kcal (assuming eating the whole chicken leg and some Chayotes). 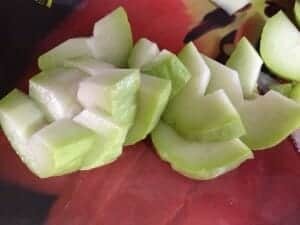 Tips: Chayote will be cut with or wihtout its skin, it’s up to you, though the skin is supposedly edible. The cut Chayotes may appear a little bit slimy, but don’t worry. Simple rinse it with salted water, or rub some salt onto the cut Chayote and rinse away with fresh water. Even not, its sliminess will disappear once cooked. It would not affect the taste and consistency of the soup. 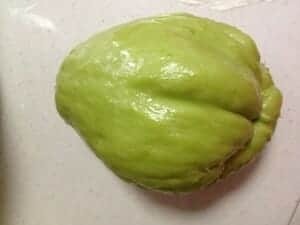 * I bought the Chayote in NTUC Fairprice at about S$1.50 – $2. * The soup may appear whitish in colour due to the pan-fried chicken which in return yields a very delicious and more flavourful taste of the soup. The chicken meat will turn very soft and tender to eat, too, not to mention the shorter simmering time So, the browning step is important. Hi PatriCa BB, many thanks for posting this article. Chanced upon your blog when i was reading the news article on “Snowfall damages farms in Vietnam” that mentioned the vege fruit chayote. Searched for what that is and available in Singapore or not, and found your blog. Thanks again for sharing. Have a blessed and Merry Christmas ahead… Cheers! Thanks and Merry Christmas, too!